"Moneyball" is a sports film like no other with its decision to concentrate on its main character Billy Beane than the actual team playing on the field. Rarely would you see actual games being played but more on the events that happen backstage - that happen at the general manager's office. This is a sports film that takes the human side of things and removes the fairy tale story on the playing field that we are all used to. These are the things that make "Moneyball" stand out from the countless sports films of past and probably any other film out now. Billy Beane (Brad Pitt) faces a dismal situation when his small-market team the Oakland A’s lose three star players to big market teams. Driven to win, Billy decides to change the game by challenging the time-tested method of scouting players. Billy looks outside of baseball and hires Peter Brand (Jonah Hill), a Yale-educated economist. Together they take on conventional wisdom by using computer driven statistical analysis. This experiment will lead not only to a change in the way the game is played but to an outcome that would leave Billy with a new understanding that transcends the game. 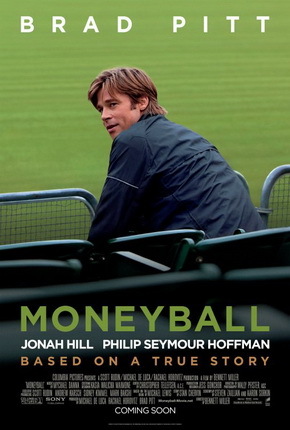 "Moneyball" hits a grand slam as it features a film full of depth, intelligence minus all the boredom that are usually associated with wordy films like this one. It's amazing really because what makes sports film thrilling are usually the actual games being portrayed on the big screen. But here, it's the complete opposite as the playing field takes a back seat for the front office work that people usually don't take into account or care about for that matter. What we can say as a definite is the film is well-paced - gripping or funny at the perfect times. Of course, the most important factor for "Moneyball" are the actors and even though Brad Pitt is headlining this film, everyone else was just as good as him. We could definitely say that this is one of Brad's best performances but Jonah Hill and the other actors "on the bench" gave deep performances that can match what the lead actor did. "Moneyball" is one of the best sports films we have seen ever and it is one of the best films to come out of Hollywood the past year. It's amazing what it has done by mixing a balance of wit, humor, seriousness but most importantly, the human factor that it captures intimately. It talks about science, statistics and computers but what makes "Moneyball" stand out are its complex characters that perfectly jive together to make a compelling sports film.